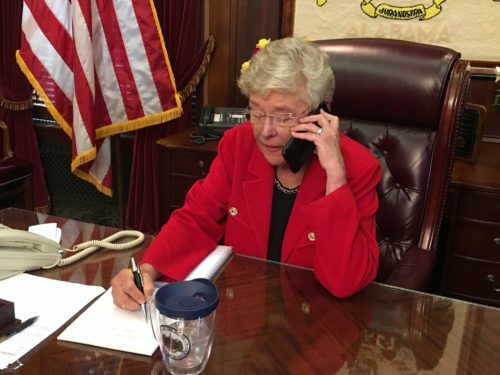 Alabama’s governor Kay Ivey is fiercely anti-LGBTQ, which led a former state representative to more-or-less out her on social media. Todd said that she had “heard for years” that Ivey is gay and that she made her girlfriend move out when she became governor. Will someone out her for God's sake….I have heard for years that she is gay and moved her girlfriend out of her house when she became Gov. I am sick of closeted elected officials. The comments that rubbed Todd the wrong way happened earlier this week as Ivey was responding to criticism from her primary opponent, Scott Dawson. Dawson, an evangelist who has written several books including the Complete Evangelism Guidebook, said that Alabama gave money to Free2Be, an organization that provided services for LGBTQ victims of domestic violence. Ivey, who signed a bill last year that allowed adoption agencies to refuse LGBTQ parents, responded that the money was from the federal government and had to be given to the organization. And she made sure that people knew that she doesn’t like LGBTQ people. “I certainly don’t agree with the agenda or the values of that organization,” Ivey said when asked about Dawson’s comments. Todd, who outed Ivey out of frustration with the governor’s comments, was the first openly gay state representative in Alabama when she was elected in 2006. Earlier this year, she received a standing ovation on her last day in the state house of representatives. Ivey’s campaign emphatically denied Todd’s Facebook message. Earlier this week, the arch-conservative Ivey joined other Republicans in calls for Donald Trump to receive the Nobel Peace Prize. Alabama’s primary elections are on June 5. Ivey became governor in April, 2017, when the former governor resigned and she is seeking her first full term.